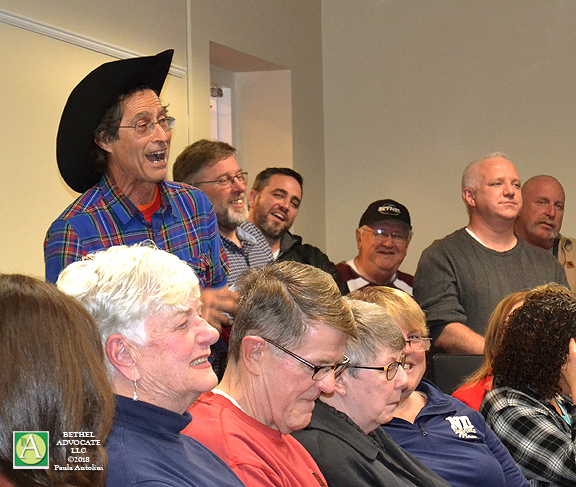 Photo: Bethel’s First Selectman Matt Knickerbocker (center) and Selectman Paul Szatkowski (left) held up an image of a rendering of a sign, for the first time to the meeting attendees, from an application re-submitted by James Naddeo for a display in P.T. Barnum Square. The banner read, “This season, no matter what you celebrate or why, Happy Holidays! — Your atheist neighbors.” The logo and name “American Atheists” was below that. 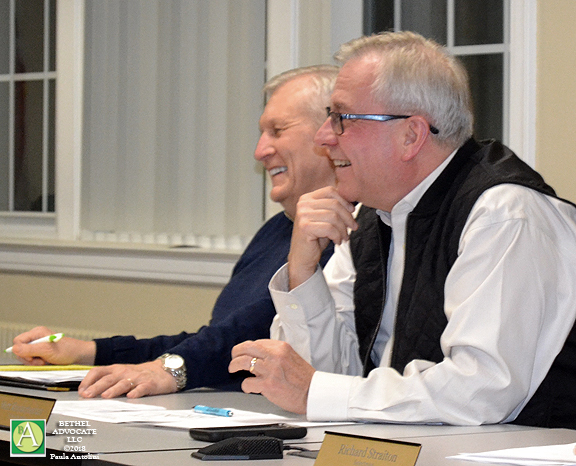 Selectman Richard Straiton (right) observes. 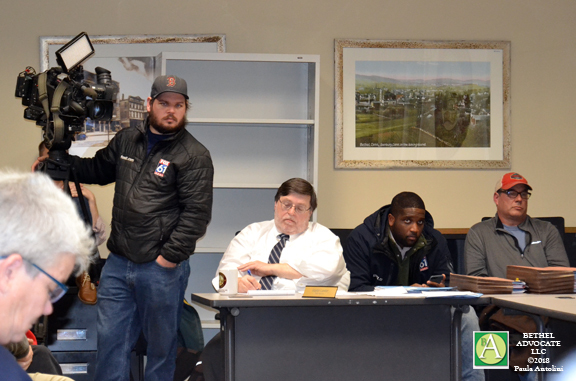 There was obvious police presence and extra news media coverage at the Bethel Board of Selectman (BOS) ‘Special Meeting for ‘Consideration of Policy for Displays at P. T. Barnum Square‘ that took place on Monday, November 26, 2018, from 6:00 to 7:15 p.m., in Room A of the CJH Municipal Building. Despite the bad weather of a heavy rain downpour the meeting contained a packed crowd with standing room only. This meeting was to address a particular application approval for a display in P.T.Barnum Square, that had been submitted on 11-5-18 by James Naddeo, a local member of the Democratic Town Committee, and also to address rules related to future applications for displays in town. Sounds of gasps, expressions of surprise, and what appeared to be disapproval came from many attendees at the meeting as First Selectman Matt Knickerbocker and Selectman Paul Szatkowski simultaneously each held up an image, for the first time to meeting attendees, of a rendering of a sign from an application re-submitted by James Naddeo recently, this time with the necessary insurance and sign design, for a display in P.T. Barnum Square. The banner read, “This season, no matter what you celebrate or why, Happy Holidays! — Your atheist neighbors.“ The logo and name “American Atheists” was below that, in red and white lettering on a blue snowy background. 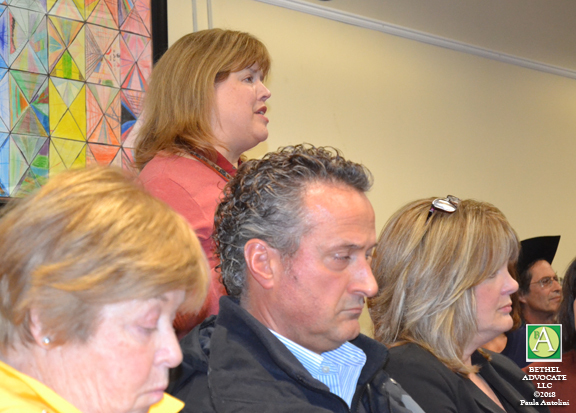 The sign design was not mentioned or shown to meeting attendees until after First Selectman Knickerbocker had closed public input. People seemed frustrated that there could not be any discussion on this additional topic of the possible sign approval and its and placement in P.T. Barnum Square along with the Nativity. 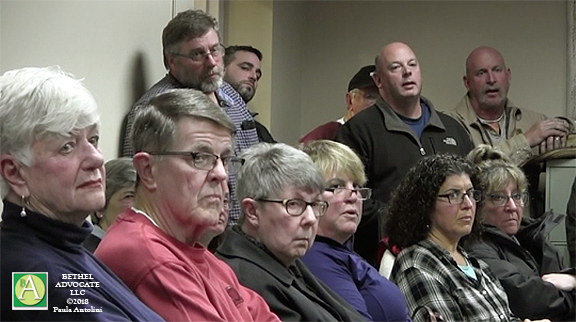 But later in the meeting at least a half dozen residents still managed to make comments about the sign, basically by just speaking without permission despite public input being closed, as First Selectman Knickerbocker did not strongly enforce this public input closure rule for all. 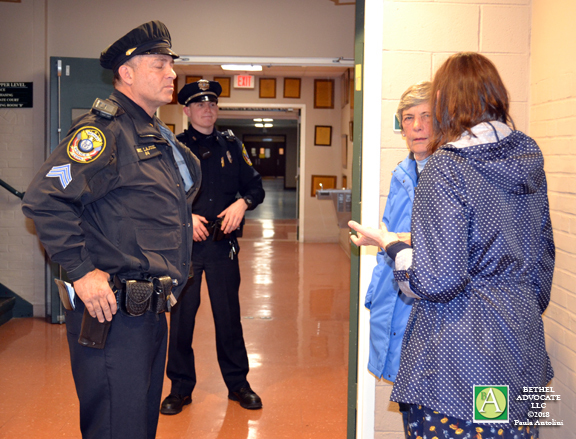 First Selectman Knickerbocker prohibited meeting attendees from speaking freely during public comments at the November 26th BOS Special Meeting, by setting up specific parameters of topics not allowed. Any reference to the person responsible for creating the controversy, or any other individual, was referred to as “indicting” others, and not allowed. 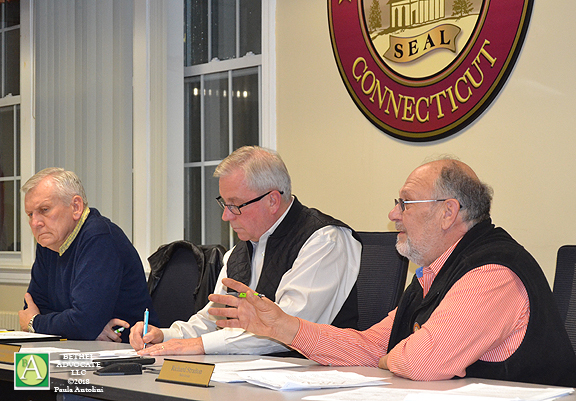 First Selectman Knickerbocker said, “There were three other applications, including two from out-of-towners, which were rejected for that reason.” The one other application was incomplete, he said. The application the BOS discussed at the meeting is the same application submitted earlier that “was incomplete, but now it is complete,” Knickerbocker said, and is the application from James Naddeo for the banner sign. 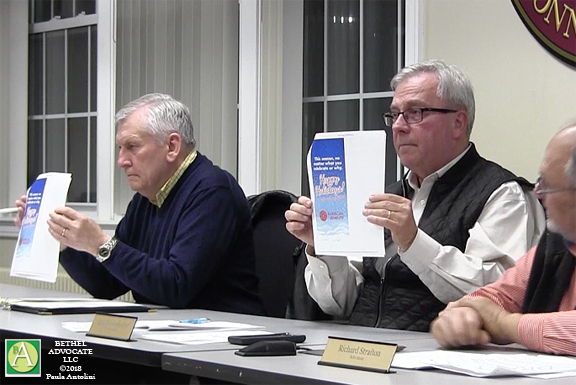 The Board of Selectmen ended up not being able to approve the sign at this meeting because the sign size was not known, so it is tabled until the next meeting on December 4th. Knickerbocker did say the application included the necessary insurance that was paid for by an individual as opposed to a company. It appears that the Board of Selectmen and Parks and Recreation Department handled Naddeo’s original application and additional applications with due diligence. 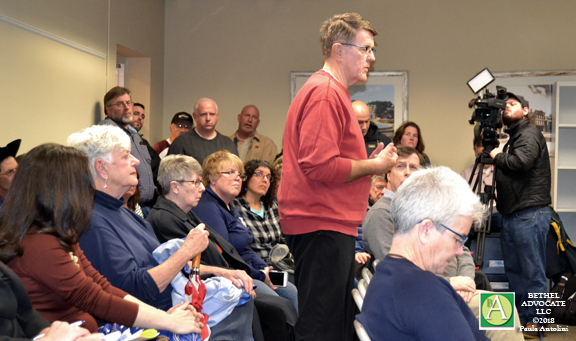 However, it also appears that they are applying the word “inclusivity” to any application, and asking Bethel town attorney Martin Lawlor if it is legal to deny an application or not. 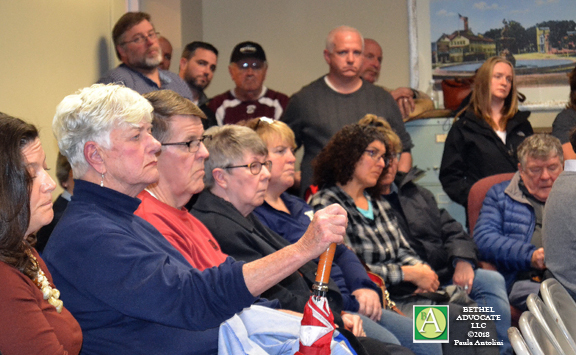 The name on the proposed banner, American Atheists (AA), is the organization whose attorney, Geoffrey Blackwell, mentioned a possible lawsuit to the Town of Bethel in one of several recent letters to Bethel town attorney Martin Lawlor. AA is representing a Bethel resident who contacted AA when his 11-5-18 application for a “Holiday Display (non-denominational) Installation and Ceremony” planned for 11-18-18 was not approved. Resident James Naddeo admitted in an online forum, at a later date, that he was the person who contacted AA. Mr. Naddeo’s actions to pursue an outside source, in this case American Atheists, while the application process was still being handled, produced not only letters to town officials from the AA attorney Blackwell, threatening a lawsuit, but also several online articles and paper publication articles were published, putting the Bethel Board of Selectmen, Park and Recreation Department, and Town of Bethel a very bad light. One article on “Friendly Atheist” was entitled, “Atheists Call for Bethel (CT) to End Religious Favoritism in Holiday Displays.” View article here. 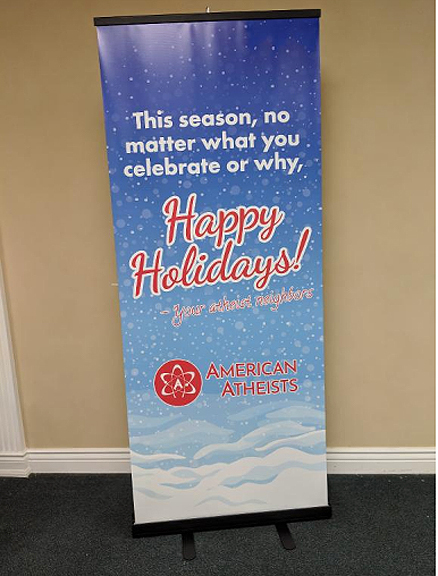 Another article on “American Atheists” was entitled, “American Atheists Demands CT Town Stop Religious Favoritism in Holiday Displays.“ View article here. 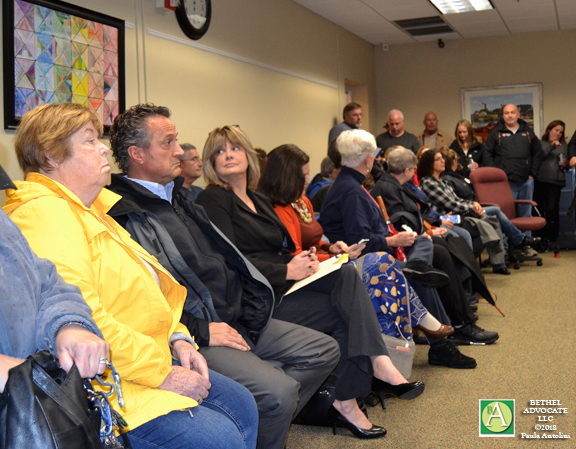 During the meeting the applicant for the banner sign in question, James Naddeo, stood in the doorway of the BOS meeting, observing, but never indicated his presence or never came forward to give comment. Most people did not even know he was present. He left right before the meeting ended. 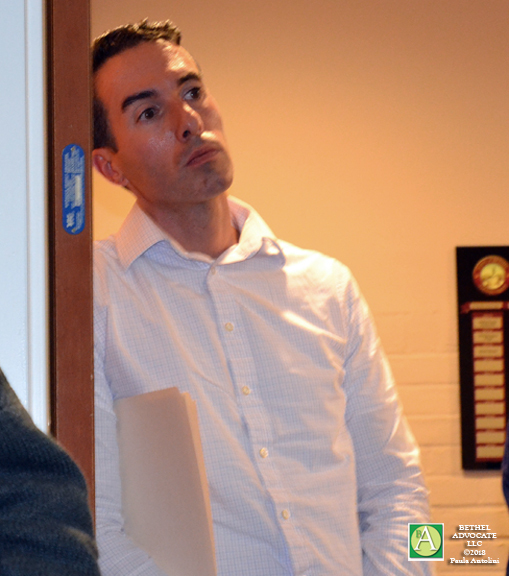 Photo: James Naddeo outside of doorway at Board of Selectman Special Meeting, November 26, 2018. This is confusing because Mr. Naddeo is applying for a display on town property, with a display expressing thoughts about religion. These two viewpoints coming from Mr. Naddeo seem to be the exact opposite from one another and seem to be contradicting his original words that “a religious monument or display” does not belong in the square (town property). We have contacted attorney Geoffrey Blackwell and are waiting for a response. Knickerbocker said he drafted a proposal for the Selectman to consider, “after a lot of study.” They would consider the policy first, then the application (James Naddeo’s) before them, he said. 1. Applications for display must be sponsored by a local religious or civic organization or local resident. 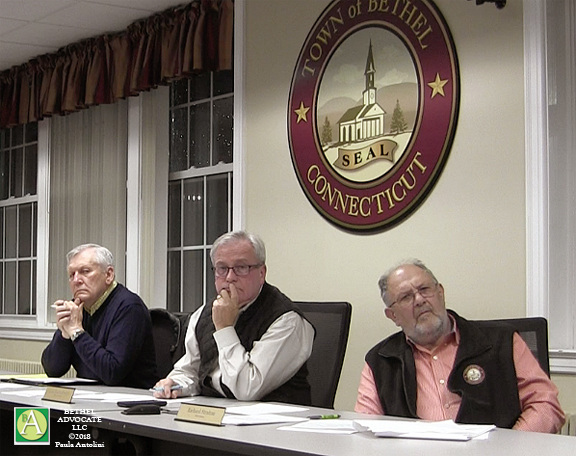 Applications from outside agencies, organizations or individuals not residing within the Town of Bethel will not be considered. 2. Applications must be made using the standard Bethel Parks & Recreation use of facilities form, which may be found on the Town website. 3. Each application must include proof of liability insurance as well as a picture or diagram of the proposed display. If a printed message is to appear, the exact wording must be included with the diagram. Excessively large displays may be rejected if they could pose a hazard to public safety. 4. The space assigned for holiday displays is limited to P. T. Barnum Square. The main lawn of the C. J. Hurgin Municipal Center is not available’. 5. Displays and messages must not demean, defame or attack any other display, religion, culture or group. We value our citizen’s right to display holiday messages that reflect their cultures and traditions, whether religious or secular, but we encourage those messages to be positive in nature. Pending the creation of a more comprehensive policy and procedure, these temporary guidelines will allow Bethel citizens an opportunity to express their own holiday greetings in an inclusive and respectful manner. Knickerbocker also clarified that at the November 13th meeting they had two applications before them, one from the United Methodist Church, that was approved (for the Nativity) and one from another applicant (James Naddeo) that “was incomplete and not denied” and they “took no action on it,” he said. 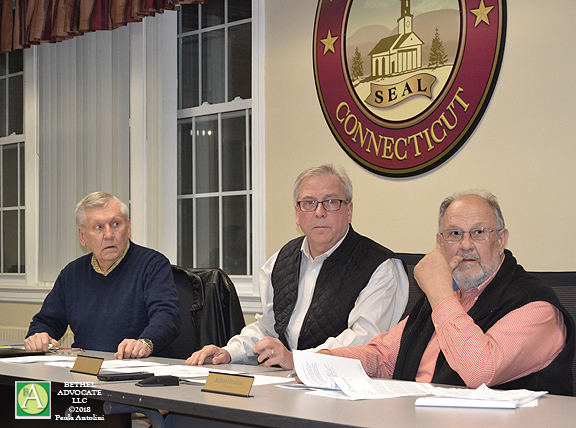 A verbal agreement from Perri Anastasakis, owner of Famous Pizza, was brought to the attention of the Board of Selectmen as a possible solution to the controversy if there is no legal way to determine an acceptable outcome to the present situation. Instead of the Nativity being removed from the Town of Bethel forever, the Anastasakis family would allow the Nativity to be placed on their private property which is bordering P.T. Barnum Square, in front of their parent’s home. Kitty Grant, a member of the Bethel Planning & Zoning Commission, said, “I’ve lived here 48 years and I cannot remember a time when we didn’t come down to the Christmas tree lighting. To me it’s community, it’s not just faith. It’s the community coming together to celebrate a season.” She then asked why we don’t have a Menorah or Kwanzaa displays. “I have no problem sharing,” she said. George Go said, “I’m open to inclusiveness but I think we ought to place limits on it. Any display that denigrates our Judeo-Christian heritage, I think should be prohibited. We should maintain respect for what we believe.” The crowd applauded. Gallagher stated, “The other thing was, P.T. Barnum was, I’d like to talk to Cynthia about, because he’s our most famous citizen. You know this famous expression, everybody in the world knows, P.T. Barnum’s favorite expression, I’m sure you all know it in this room, that, “There’s a sucker born every minute’ … he gets credit for it. Anyway you learn a lot about the history of Bethel if you read his biography. Legnard said, “I agree with Larry, you know, we have to all get along in this town, we have to live in this town. I don’t always agree with Billy Michael but I can spot Billy Michael anywhere and talk to him, and give him my point of view and he gives me his point of view, and we walkaway and we don’t agree with each other, but we at least listen to each other. And that’s what has to happen in this town, to listen to what the people in this town want. And the number of people sitting in this room tonight are saying ‘this is what we want, we want a public display of a creche that was created by five churches in this town’ and people who worked together to get the thing put together so it was presentable. The old one wasn’t always presentable because it was so old and worn. And maybe if we hadn’t looked to put our best foot forward with a new creche this all would not have happened. And I hate to say that is what happened but the notoriety wasn’t there until we tried to do something good. These guys that did something good ought to be commended.” Mr. Legnard then received applause from the crowd. View videos and more photos of the meeting below. Photo: The picture shows a sign shown by by friendlyatheist here: “Bethel (CT) Officials Debate Presence of Atheist Sign Next to Nativity Scene” which could show the approximate size of the proposed sign for P.T. Barnum Square, or not, since it is the same visual design. We will discover the actual size at the next BOS meeting on Tuesday, December 4th at 7:00 p.m.